Let me just come clean and put it out there: I have developed a serious writer crush on Christian Rudder after reading Dataclysm: Who We Are (When We Think No One’s Looking). Christian Rudder is the cofounder of OkCupid (and on-again off-again author of the popular OkTrends blog) so it’s not too surprising that his writing has the power to evoke some pretty serious swooning. Powerful storytelling and hooks. Every chapter opens with some sort of story or anecdote that draws you in, whether it’s about the power of nostalgia or the internet’s ability to build up heroes and tear them down instantly. Pretty impressive for a book that’s centered around data, numbers, and charts. Rudder’s sensitivity to limitations and privacy concerns. In a brief interview on Amazon.com, when asked about whether he’s worried about any of his research and its implications, Rudder says, “I have mixed feelings about the implications. I myself almost never tweet, post, or share anything about my personal life. At the same time, I’ve just spent three years writing about how interesting all this data is, and I cofounded OkCupid. My hope is that this ambivalence makes me a trustworthy guide through the thicket of technology and data. I admire the knowledge that social data can bring us; I also fear the consequences.” I also appreciated how in several instances, he explains why he’s only looking at a certain segment of the population and what impact that can have on his overall assessments. Dataclysm is definitely one of the most well-written and thought-provoking books I’ve read in a while, and I hope that taking the time to make these observations will help me to become a more sensitive and skillful writer myself. 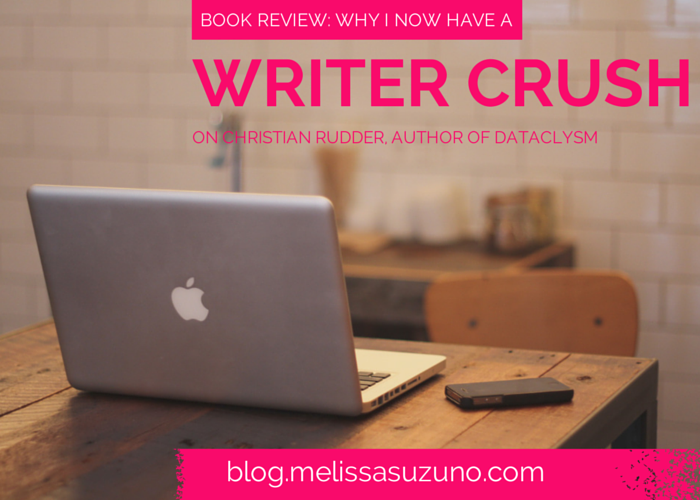 Have you developed any writer crushes lately? What attracted you to a certain writer’s voice, content, or style? Let me know in the comments!